The Taiwan group signed letters of intent with corn and soybean producer groups at the Abraham Lincoln Presidential Library in Springfield. Last week, representatives from the Department of Agriculture hosted members of a Taiwanese trade delegation in Springfield as part of a goodwill mission designed to further a long-standing trade relationship. "Illinois' products are the best in the world, and we are committed to selling those products in the global marketplace," Governor Pat Quinn says. "Agreements that help us increase trade with Asia are essential to ensuring our role as a leader in the global economy and bringing good jobs home to Illinois." The Taiwan group signed letters of intent with corn and soybean producer groups. 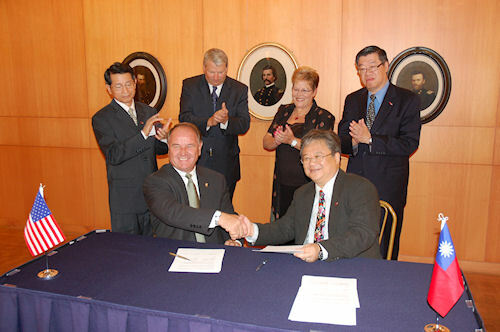 The 22-member delegation from Taiwan agreed to import additional Illinois grain in 2012 and 2013 and signed letters of intent with the Illinois Corn Marketing Board and the Illinois Soybean Association during a visit to the Abraham Lincoln Presidential Library. "The Illinois agriculture industry is dependent upon export agreements like this," Agriculture Director Tom Jennings says. "Forty percent of Illinois grain is shipped out of the country and we thank the Taiwan Feed Industry Association and the Taiwan Vegetable Oil Manufacturers not only for their business, but also for their long-standing friendship." The Taiwan Feed Industry Group signed commitments to purchase 303 million to 413 million bushels of U.S. corn and 0.5 million to 0.75 million metric tons of corn by-products. Illinois will supply approximately 43 million to 59 million bushels of the corn. At current prices, the deal is worth $288 million to $393 million to the state's corn growers. "Illinois farmers are pleased and encouraged by the sale of Illinois corn and corn products to the Taiwanese," says Illinois Corn Marketing Board Chairman Bill Christ. "Even though this has been a tough year, Illinois farmers remain reliable producers, and Taiwan continues to be a valued customer." The delegation, which also included representatives from Taiwan's Vegetable Oil Manufacturers and Oilseed Processing Association, signed similar letters outlining its intent to purchase up to 118 million bushels of U.S. soybeans. Illinois' share of the transaction is around 14 million bushels, or $182 million worth, of soybeans. "We thank Taiwan for their continued support of our industry and Illinois soybean producers," adds Illinois Soybean Association Chairman Matt Hughes. "We look forward to building a stronger relationship with them, especially since more than half of our soybeans are exported to countries like Taiwan each year." This year Taiwan is the sixth-largest export market for U.S. agricultural products and the fifth-largest market for U.S. corn and soybeans. While here in the state the delegation will visit a central Illinois farm and tour a rail terminal grain elevator before continuing on its U.S. tour.